*This is a review of Red Gate Beauty products. I was provided the product to complete this review. All opinions are my own. How many times have you put on lipstick in the morning only to have it completely erased before lunch? It’s rather annoying because no one has time to constantly reapply; yet you want to keep your lipstick on for more than an hour. Did I mention the fact that cosmetics aren’t cheap? So when you do invest in products, you want them to get the job done. That’s where Red Gate Beauty products come in. I recently had the opportunity to try out LipSense by Red Gate as well as the moisturizing shea butter based gloss. With 40 warm, cool and neutral colors to choose from there is something for every facial tone. I chose the “Bella” shade as well as the “glossy” lip gloss. The color is guaranteed to last 4-18 hours, so I put it to the test. I applied it as recommended; one thin layer at a time for a total of three layers (waiting a few seconds in between each one). I noticed a big of a tingling sensation, but that’s normal with this product because of the denatured alcohol that creates a bacteria free environment in the tube. If you have dry lips, like me, you tend to feel it a little bit more. It does diminish within a few seconds, so don’t get scared. The color went on smooth and I really liked it. It’s horrible when you like a shade in the store or online and then once you get it home, you’re disappointed. But, this was not the case with the LipSense. Since I liked the color, I went ahead and applied the gloss. What I loved about the gloss is that while it made my lips shine, it didn’t leave them feeling gooey. I’ve tried other lip glosses that have left my lips feeling sticky and actually on the gross side. But, not with the LipSense products. After the products were applied, it was time to put them to the test. That meant a normal day of eating, drinking, wiping my mouth, etc. Through lunch and even through dinner time, the color did not disappear. While the gloss factor diminished, the color was still visible. There was no need to reapply. By the time I was ready to wash my face for bed (about 15 hours after applying); I could still see trace amounts of color! This was easily removable with some oil based makeup remover. 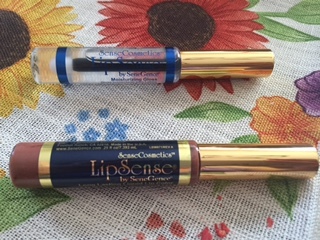 If you’re looking for a long-lasting lip product, give Red Gate’s LipSense products a try. Get a 15% discount when ordering online by using the coupon code bloggymoms15 at the checkout. You won’t be disappointed! Awesome!! I was looking for a honest review from someone who sell it.